Next week, letter lovers from around the globe will descend on London for the city’s first international gathering of Letterheads, bringing together veterans and novices of the signwriting and lettering trades for workshops, lectures and exchange of ideas. The centrepiece of this event is a contemporary interpretation of an exhibition of signs which took place in Covent Garden in the eighteenth century. 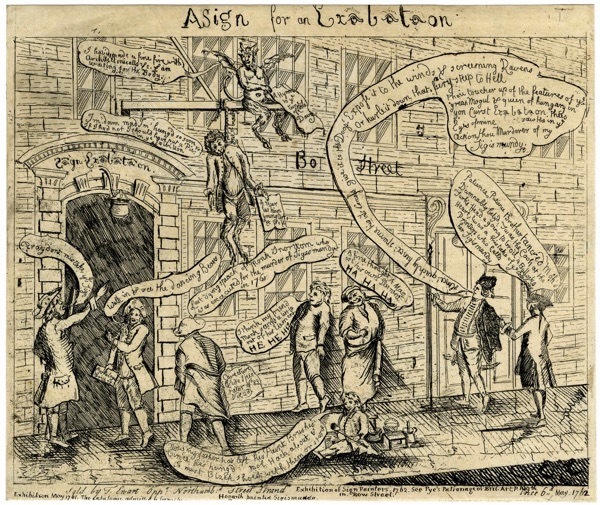 The 1762 Grand Exhibition of the Society of Sign Painters was a satirical show, mocking an exhibition at the Society of Arts by placing signboards taken from the streets in an art gallery and titling them with playful and facetious descriptions. This show is the inspiration for the 2018 Grand Exhibition of the Pre-Vinylite Society at Oxo Tower Wharf from August 16th-19th, for which twenty-nine contemporary signwriters have painted signs in response to the eighteenth century exhibition. The next mention of the Grand Exhibition came on May 26th: “several ARTISTS (Natives of Great Britain) are invited to send to the printer of this paper, a list of those capital pieces, which they intend to submit to the public Judgment. N.B. 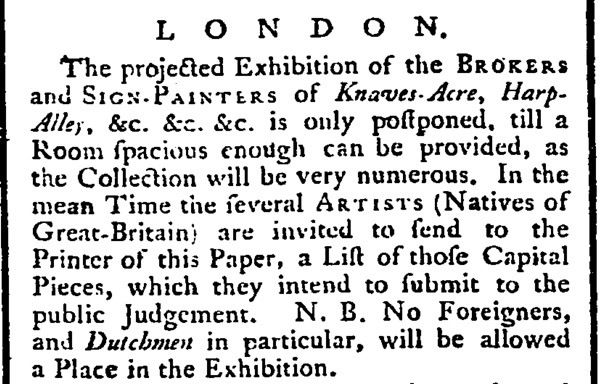 No Foreigners, and Dutchmen in particular, will be allowed a Place in the Exhibition.” The nationalistic nature of this announcement, insisting that artists must be “Natives of Great Britain,” satirises the Society of Arts’ exhibition which championed native British artists over those from the continent. In the months following the announcement, the St James’s Chronicle was flooded with accounts of the Grand Exhibition as well as objections to it. 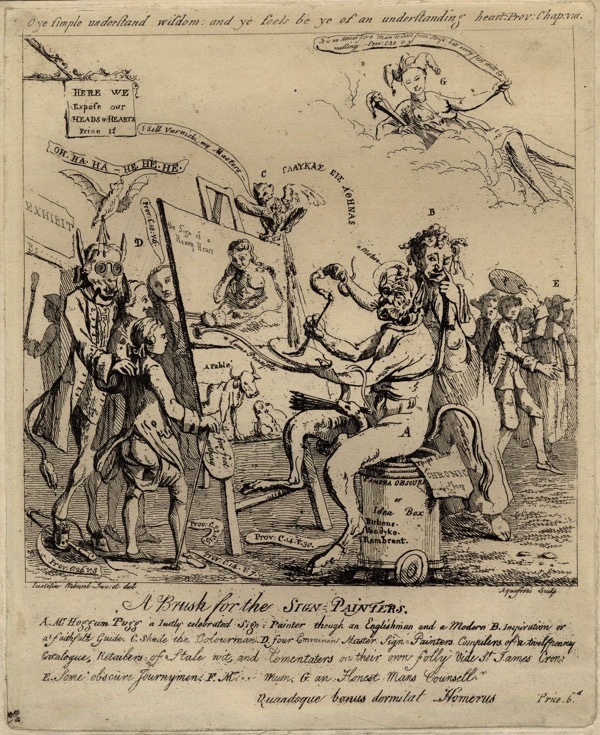 Coverage in other London periodicals – advertisements, announcements, descriptions, reviews, and satirical cartoons – ensured that the Grand Exhibition of the Society of Sign Painters became a media spectacle. By holding the “low” art of sign painting up to the “high” art exhibited at the Society of Arts, the Society of Sign Painters challenged the basis of an art exhibition and became – arguably – the first ‘anti-art’ installation of objets trouvés. 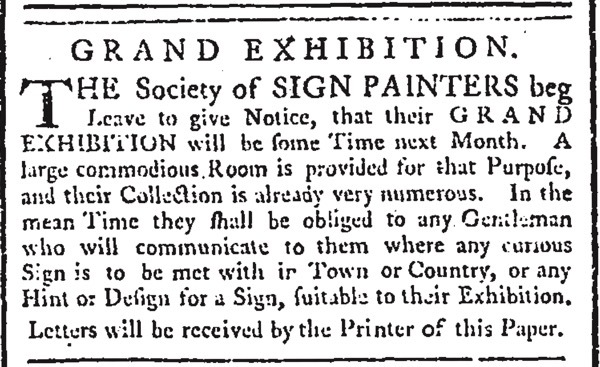 A year later the St James’s Chronicle announced another exhibition of signs, on 13th March 1762. This time, they asked for public assistance in locating signs to be removed from the streets. 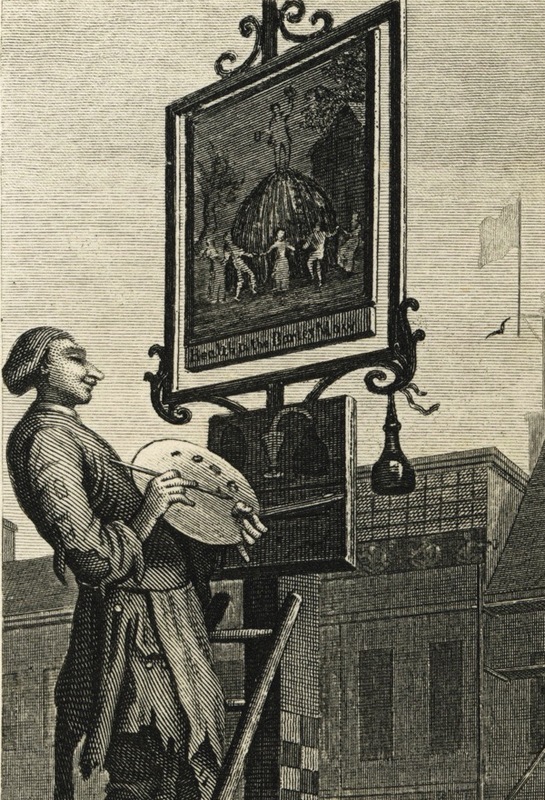 The announcement reports “that the majority of the signs displayed at the exhibition were authentic – that is, they were gathered from the town or countryside rather than painted especially for the occasion.” While some signs were supposed to have been painted by William Hogarth, most were taken from the streets, at the time of the Westminster Paving Act which required the removal of dangerous hanging signs. Perhaps the idea of an exhibition of signs was a mere jeu d’esprit in 1761, conjured into existence for the amusement of the Nonsense Club. Yet by 1762 plans were well-advanced and since spoofed objections in the St James’s Chronicle could no longer be distinguished from real ones, the effect was both to generate publicity for the show and sell copies of Chronicle. The success of the Grand Exhibition, apparent in the number of reviews it received, is a testament to the ability of newspapers to fuel interest in any novel event of the time. Yet the proliferation of coverage created a wave of suspicion surrounding the exhibition. Most of the announcements appeared in the St James’s Chronicle but the Society of Sign Painters attempted to advertise in other papers as well. The London Evening Post refused to run their advert, calling the organizers “a pretended Society of Sign-painters” and citing mockery of the Society of Arts as the justification. While the Society of Sign Painters denied any implication that their exhibition was intended as a satire on the Society of Arts, we can agree that it was. Despite their insistence, the ironic tone of their rebuttals suggest otherwise, as is obvious in their explanation in their catalogue. 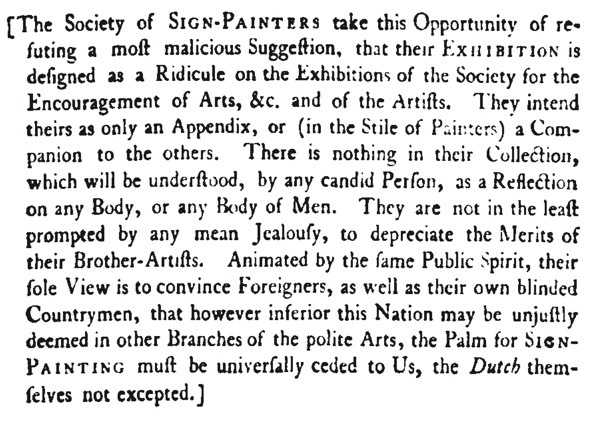 The satirical basis of the 1762 exhibition was that the presentation of street signs in a gallery was laughable. Even in our own century, sign painting is rarely hailed as an endeavour worthy of an exhibition. The Pre-Vinylite Society believes hand-painted signs should be considered art and our forthcoming Grand Exhibition is a rebuttal to the Society of Sign Painters’ implication that placing signs in a gallery is an act of absurdity. Rejecting the insularity of the Society of Sign Painters’ exhibition in 1762, we celebrate the global renaissance of sign painting by featuring artists from eight countries. 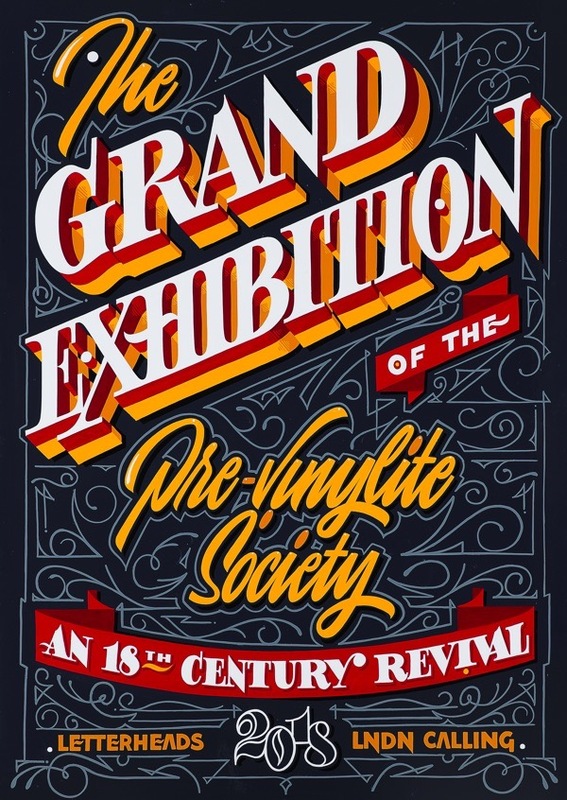 The Grand Exhibition of the Pre-Vinylite Society is at Oxo Tower Wharf, 16th-19th August. Curator Meredith Kasabian will talk at the gallery at 1pm, 16th-18th August. Admission Free. Better the sign in the 18-19th C more trade, they talked to the customers big is good enticing them in especially coaching establishments. I’m thinking of old films where signs squeaked as they moved in the wind. An old style sign still survives at the Llandoger Trow pub (timber built) in Bristol of Treasure Island fame. John a poet, Poetry Soc, Bus Pass Poets. If only, if only we could return to the days of hand painted signs on business premises instead of the ghastly plastic monstrosities that are now so popular. Our street, of mainly mediaeval buildings, is suffering from this with plastic signs proliferating despite planning regulations. Hand painted signs contribute so much more to the street scene and anything which improves our quality of life is desperately needed in the times that we live in ~~~ bringing back wooden hand painted signs would be a good start say I ~~~ get rid of plastic wherever possible. What a brilliant piece of history. I’d love to know more about the Nonsense Club? Lovely, thank you very much for featuring the show on your esteemed blog. We look forward to welcoming you for a look around next week. Sam. Another great profession slowly passing away. As previously written now all plastic and vinyl. I had a neighbour who was a sign writer for a local bus company. I wanted a coach line around my car trying to do it myself was impossible until he got out his gear and in a flash with a long haired brush it was it was done. It’s very sad that things we remember from our youth are slowly disappearing, but meetings like this one and others bring it all back. Hi Meredith, My Dad – Frank Hebbard – used to be a pictorial sign writer and painted pub signs for Courage pubs and another brewery (which I temporarily forget) from the 70′s to about 1996. He was employed by Perkins and Sons, (used to be owned by David Perkins until the went into liquidation.) They were based somewhere in Tower Hill. I have lots of sides and photos of his work and also some actual photos of him painting which Courage’s used in adverts (I also have newspaper cuttings.) Funnily enough, Frank (with me doing some very basic filling in,) did a huge sign that went up in front of the OXO Tower when it was being redeveloped. It was so big that it would not fit in our garage where he worked and had to be painted in a local barn. I will try to remember to visit your exhibition and introduce myself to you. Please let me know if you are interested in seeing any of these photos. Thank you for the opportunity to share my research! It’s an honor to write for Spitalfield’s Life! If anyone is interested in learning more, we’ll have an exhibition catalogue for sale at the Bargehouse Oxo Tower Wharf, Aug 16-19. 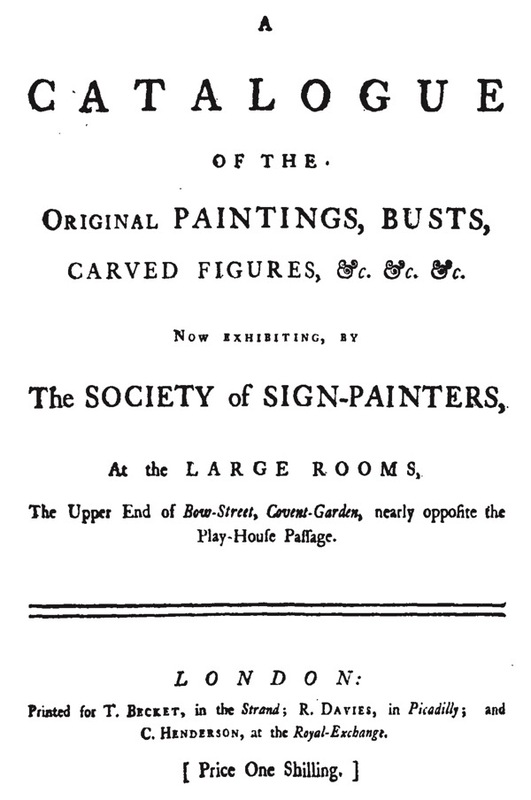 The catalogue includes photos of the work in the show, as well as a long-form essay about the Society of Sign Painters’ exhibition and 18th century signs in general. Andy, the Nonsense Club was a group of journalists, essayists, poets, and playwrights who held regular meetings to share their work and satirize the popular culture of the day. Hogarth is supposed to have attended some of their meetings but he was not officially a member. “The Nonsense Club” by Lance Bertelsen is the authority on the topic. Joan, I would love to see your photos! My grandfather was a sign painter as well, from the 1930s-70s in Boston, USA. Stop by the Bargehouse gallery (1st floor) between 11am-6pm Aug 16-18 and say hello! Thanks to all who took the time to read and comment. Hope you can make it to the show! A classic example to show xenophobia has been with us for centuries. Of course the French and the Dutch were widely blamed for causing the Great Fire of London almost 100 years previously. As always, an interesting and eclectic historical piece.